That statement implicitly assumes the ESC, because it assumes isotropic speed of light c–meaning the same speed in all directions–which then means any measurement of the speed of light c will be about 300,000 km/s (or 186,000 miles/s). That initial assumption guarantees it. You may think you assumed nothing but just that stating the light took 8.3 minutes to travel to Earth from the sun means you made the assumption. This statement also one might hear, but it implicitly assumes another clock synchrony convention, the ASC. 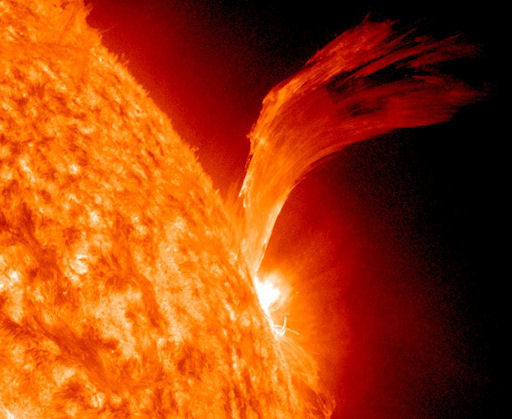 This is because those speaking implicitly assumed the event “the eruption of the massive solar flare on the sun’s surface” occurred simultaneously with their observation of it. They may know no physics but they have made an unspoken assumption on the speed of light nevertheless. In other words, it sounds to me like the ASC model makes it impossible for the cosmos to be actually 6,000 years old, because if c is only 186,000 miles/s, and if no time dilation occurred, then the universe must be billions of years old. To this statement I wrote: your phrase “if c is only 186,000 miles/s” means you assume isotropic speed of light, which means you assumed the ESC; so you just made a circular statement like saying “if this table is 3 feet long then it must not be anything else but 3 feet long”. Your premise excludes all other possibilities. When did the author of Genesis think the events occurred? He replied with the following where my responses are inter-dispersed between his. You cannot have your cake and eat it too. In the case of observations in the Universe, the observer is any type of measurement. It does not need to be a person or animal, it could be a machine or even an atom. So to agree when it occurs an observation must be made by an observer. You cannot say ‘it occurs without an observer’. That’s ‘your cake’. Then the ‘eat it too’ part is you invoke God as a sort of universal observer. But you can’t do that because He is outside of time and all observations we are talking about are in time. It is the very basis of our understanding of nature over the past 100 years. If you deny this then you are denying our current understanding of the nature of the Universe. Otherwise you are reverting to the absolute conception of space and time that was held before the 20th century and particularly before measurement of the isotropic speed of light. In short, unless an observation is made an event does not occur. 2) The events of Creation Week occurred on the days Genesis says they occurred. Thus the celestial bodies were created on Day 4. But by whose clock synchrony convention? There is no absolute choice here. So which is the language of the Bible? I’d say that the ASC is the convention that people through all history have used except for the past 300 years, and particularly the last 100 years. The author of Genesis 1, who I believe was Adam (not Moses), wrote Genesis chapter 1 from the perspective of the earth’s frame of reference and simply stated all events occurred as he would have seen them, if he had been there. He took that as a simple assumption. He would not have even known about the constant isotropic (or 2-way) speed of light. Stars were made on Day 4 when earth ‘observers’ saw them. If you like, the flowering plants did ‘see’ them, since they were created on Day 3. I am sure they recorded the event when it happened. In response to your other reply on this subject: no, the phrase “if c is only 186,000 miles/s” doesn’t mean I “assume isotropic speed of light which means you assumed the ESC,” because the word “if” logically implies a possibly unreal condition. Your response, by contrast, implies another possibility. Since I read further after my emails, are you implying that “186,000 miles/s” in only within our reference frame? How do you know the speed of light c is only 186,000 miles/s (300,000 km/s)? I’ll answer that: Because someone measured it. But that someone assumed isotropy of the speed of light to make the measurement therefore (maybe without knowing it) you did assume the isotropic speed of light, which means the ESC was assumed to make the measurement. It is basic physics. No measurement of the speed of light can be made without making an assumption on either isotropy of the speed of light or a choice of a clock synchrony convention. The Einstein Synchrony Convention (ESC) means that the speed of light is assumed to be isotropic (i.e. the same constant value c in all directions) but the Anisotropic Synchrony Convention (ASC) means that the incoming speed towards the observer is assumed to be infinite and the outgoing speed assumed to be ½c. Hence it is assumed to be anisotropic. So there is definitely another possibility; more than one actually. The isotropic speed c = 186,000 miles/s (300,000 km/s) is a result of the assumption of ESC. I can’t be clearer than that. Earlier you mentioned Exodus 20:11. For in six days the Lord made the heaven and the earth … and everything in them. That covers it all and it includes the stars and galaxies. From Adam’s perspective, if he was on Earth on Day 4 he would have seen many stars light up in the night sky, but he may not have been able to see the much fainter light from distant galaxies yet nevertheless they were created that day also and light from them, as feeble as it was, illuminated the earth. If it didn’t we would not be able to see them today with our big telescopes. And there were ‘clocks’ on Earth that ‘felt’ that light arrive, which time-stamped the event of their creation that day. There is no trick here. To an earth observer the light instantly arrived the moment God created the heavenly bodies. In the figure shown above all light from all galaxies arrived at the Earth the first time on Day 4. 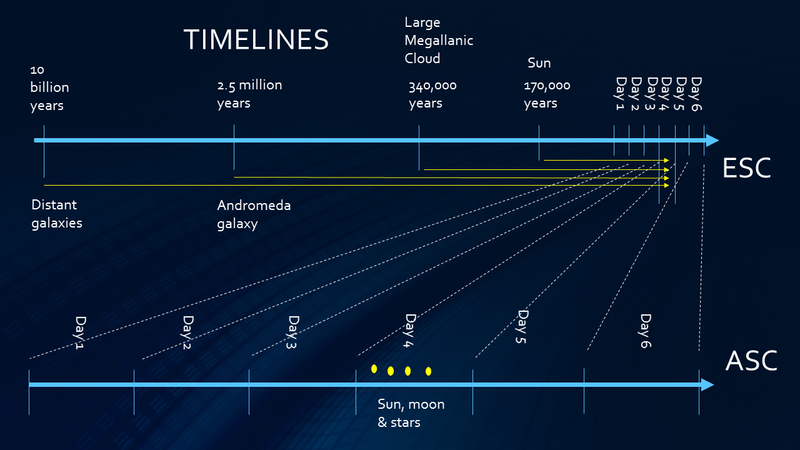 From the ESC perspective (top timeline) you would have to say the light travelled for millions or billions of years before Day 4, even before Day 1 (creation of Earth). However from the ASC perspective (bottom timeline) all that is seen is the lights flashing ‘on’ the moment they were ‘observed’ by a local earth observer, which may be considered as the plants or even the atoms of the earth itself. Neither of these two timelines is the absolute timeline of the Universe–there is no such thing. The real question is which is the convention used within the language of the Bible, in the Genesis creation account especially. I say it is the ASC where all events are timed by when the event is observed (or could have been observed by a human if you like). Now you might query me here when you note that under the ESC timeline light had to travel 170,000 years to get to Earth but we all know it only takes 8.3 minutes to travel the 150 million km (93 million miles) from the sun to Earth. Right? Well, there I allowed an extra 170,000 years for the photons to rise, by random walk, to the surface (the photosphere), from the interior of the sun, where they are generated by nuclear fusion. So the first photons coming from the sun, if they are the products of a real physical process that generated them, then they had to have taken all that time. For those photons only the last 8.3 minutes of travel time, at constant c (under the ESC), was through the vacuum between the sun and the earth. Thus the sun must have been created at least 170,000 years before the first light left it surface under the ESC. And if that is our assumption of real events that occurred at Creation in the stars, under the ESC, then the stars in the Large Magellanic Cloud (LMC) also must have been created an extra 170,000 years before the first light left their surfaces, under the ESC. That small LMC galaxy is at a distance of about 170,000 light-years from Earth, hence the total time of 340,000 years is required (under the ESC). However, under ASC, the incoming 1-way speed of light, even from the core of the sun, is infinite, and there is no travel time. This is true from any source in the Universe, no matter how distant. So the bottom timeline applies. I’m confused about time dilation. I was under the impression that time runs faster the farther away from gravitational forces you are. So the closer you are to planets or stars or anything with gravity, the slower time is. With that said, in the ’empty’ space between galaxies, wouldn’t time pass much faster in relation to time on Earth? You are correct. Deeper into a gravitational well a clock is the slower it ticks compared to a clock out of the well. That means within a region like the solar system the gravity well may be slightly lower in potential than outside the galaxy and hence clocks tick slightly slower than outside. The details depend strongly on the details of the physical system under consideration. GPS clocks are higher in the gravitational potential well of the Earth than a similar clock on the surface of the Earth. Thus the GPS clocks would tend to tick a little faster. They are moving quite quickly though and that tends to slow its atomic clock relative to the clock on the Earth’s surface. But since the gravitational effect is much stronger the net effect is that the GPS clocks gain about 38 microseconds per day. But details do matter. Don’t forget the famous twin paradox of Einstein. If the difference in clocks is only minimal, say clocks on earth verses clocks in the open space between galaxies, then I guess time dilation does not really play a big part in YeC cosmology. I have read your other posts on your top models for cosmology and I certainly understand that God could use time dilation to supernaturally speed up the clocks in the universe during creation (which I feel is the best model), but I guess I was just hoping that time dilation would definitively solve the starlight and time problem. Such as time runs MUCH faster in the open expanses of space far away from gravity compared to earth. Maybe I’m just still confused? It seems you do understand correctly. To get such a situation one must have some special conditions on the state of the Universe. This is what happens in Humphreys’ second model. It uses an extreme form of time dilation where the time dimension turns into a space dimension and as such clocks stop in his timeless zone, which is centred on the Earth during Creation. So with such a special construction, meaning form and density of the Universe at Creation, Humphreys gets time dilation to be a big deal. It is a possibility but I think we need to keep thinking. You wrote, “people not familiar with ideas of relativity and the speed of light measurement may have confusion or misunderstandings on this topic”. That is an understatement! This article simply magnified the south Texas cut, “Oh, he’s just a farm boy. Working the dirt is different than working the mind.” You definitely make me think that my mind doesn’t work, but I actually did grow up on a farm. May God bless and use your mind! For me, time dilation seems to be the most plausible answer based on what we observe in the universe today (based on what this layperson understands). I just can’t help but feel that the ASC model is a fudge factor in its own right; it can’t be observed, it can only be assumed. I’ll have to continue to explore and learn about the ASC model and cosmology in general. Thank you for all that you do John. I love this stuff!